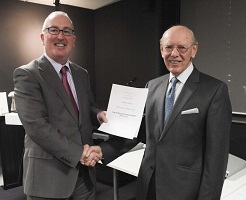 The Pensions Archive Trust is pleased to announce the acquisition of records from The Pensions Management Institute (PMI). 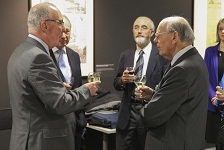 The Institute’s archives are a welcome addition to the Pensions Archive’s existing holdings at London Metropolitan Archives (LMA), and the deposit of the material was marked with a Reception at LMA, attended by the Chief Executive of PMI Vince Linnane and members of the PAT Board, on the 27th November. The PMI archive complements the Pensions Archive’s existing collections from other pension industry bodies, which include the National Association of Pension Funds (NAPF), the Society of Pension Consultants (SPC), the Pensions Research Accountants Group (PRAG), the Pensions Policy Institute and the Pensions Institute. Established originally as the Institute of Pensions Administration in 1975, the Institute was sponsored by four representative bodies for the pensions industry, namely the NAPF, the SPC, the Life Offices' Association and the Association of Consulting Actuaries and formally launched as The Pensions Management Institute Limited in June 1976. Now based at Artillery Lane in the City of London, the Institute sets and promotes standards of excellence and lifelong learning for pension professionals and trustees through qualifications, membership and support services. The Institute also runs two Conferences, two Trustee Seminars and a range of other technical seminars each year. It produces a number of publications, including PMI News, PMI Technical News and, in conjunction with PRAG, Pensions Terminology, which is currently in its eighth edition. The records deposited with the Pensions Archive include minutes of the Institute’s Council and committees, as well as the Institute’s responses to Government consultative papers between 1996 and 2010. There are also a set of papers on the Institute’s Model Administration Agreement, which was launched in 2002, and a photographic archive. UPDATE - FEBRUARY 2013 The collection has now been catalogued with reference LMA/4621 and can be accessed at London Metropolitan Archives.